To rank as a top 5 overall provider to Fortune 500 clients who ship consumer packaged goods by creating boutique solutions which adapt to lane volume variability, routing guide changes, and on-demand supply chain requirements. We maintain and repair moving parts of your transportation machine: we don’t drive the machine, we fix it. 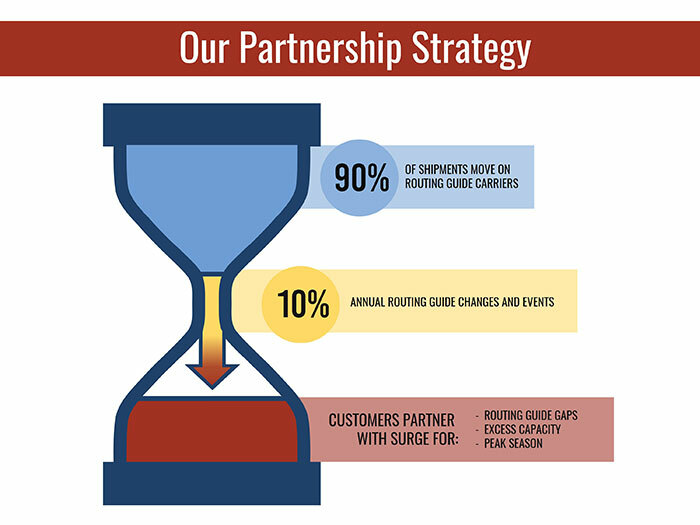 Our role is to provide maintenance to your routing guide throughout the year as it experiences changes so that your supply chain is always running. This maintenance and repair comes in many forms – our response time has to be faster to short notice needs; our ability to swell has to be much greater; we need to be able to add lanes and assist on lanes with almost zero lead time; we need to cover peak season surges; we need to provide business continuity on high volume lanes; we need to keep raw materials moving 100% of the time so that manufacturing lines never go down; we respond to weather disasters. These movements account for only about 10% of a shipper’s annual volume, but they are overwhelmingly the majority of the most critical shipments in the network and take up 90% of the operator’s attention; it is when the machine starts falling apart that we repair it.